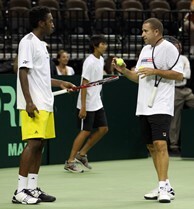 Evan King with Davis Cup coach Jay Berger. Evan King is a star junior player at the University of Michigan, being named an ITA All American and All-Big Ten this past season in which he went 30-9 in singles and reached the round of 16 in singles at the NCAA Championships. This week the lefty is serving as a practice partner with the U.S. Davis Cup Team of Andy Roddick, Mardy Fish and Bob and MIke Bryan led by Captain Jim Courier as the team prepares to face Spain in the quarterfinals July 8-10 in Austin, Texas. King will be writing a blog for USTA.com before and during the tie so check back daily for updates! The last two days have been a lot more uneventful off of the tennis court, but full of action on the court. With that being said, I apologize in advance to anyone about to read this expecting a repeat of the hot dog eating contest. I got out of my King sized bed at around 7:20, checked the thermostat in the room to make sure it still said 68 degrees (it did), and then went up to breakfast. This time Steve and I got the honor of practicing with the Bryans at 9 a.m. for about an hour and a half. Those guys are sharp. We started off by playing about five games of two up to back, and it really is almost impossible to beat them. I honestly think that if we put all three practice partners on the same side of the net they would still take us down. Believe me when I say that the Bryans are the best doubles team to ever live. We finished up by playing some service games then we watched Mardy hit with Bradley. In the afternoon Wednesday, practice was open to the public so about 600 Andy Roddick fans came to watch Steve and Andy hit some balls. When they were done hitting, they gave the court to Bradley and I. We played some points. In the middle of our set, Andy thought it would be funny if we played a couple of points with him laying face down at the net. The crowd loved it. For those that don’t know, Andy and Mardy have a "plank" war going. For those that don’t know, planking is just laying down in bizarre places. When they are off of the court, they spend a lot of time thinking about where the next plank will take place. Today was a pretty cool day as well. The big event of the day was the draw ceremony. The band Asleep at the Wheel played a couple songs to start the event. After a while, the emcee introduced both teams. The U.S. team definitely got more applause than the Spanish team but one thing stood out. When the emcee announced both Fernando Verdasco and Feliciano Lopez, a decent amount of grown women went crazy. One actually fainted and they had to stop the entire presentation… ok, that didn’t happen but that’s the type of reception they got when they walked on stage. USTA Chairman of the Board and President Jon Vegosen then said a couple of words, and the order of play was released. Mardy will be starting us off against Feliciano Lopez, and Andy plays David Ferrer after. After the ceremony I practiced with Mardy, and gave him my best Feliciano Lopez impersonation. I think I hit more slice backhands in that practice than I did in all of the dual match season. After we hit, Andy and Steve came out and practiced for a while. In the end, Andy gave us another lesson on how to play squares by embarrassing us over and over again. The last couple of days have been pretty eventful both on and off of the tennis court so I’ll just dive right in. Having a Davis Cup in Andy Roddick’s home town definitely has its benefits. On the Fourth of July he invited the whole team, (including us rookies), and a bunch of his friends over to his house for a barbeque. Even though Andy’s house was the biggest house that I have ever seen not to be on MTV Cribs, it was not all great. After our morning practice, the whole group was watching Sportscenter. On the bottom line were the results of the Nathan’s Hot Dog Eating Contest. Joey Chestnut won by eating 62 dogs and buns in 10 minutes. That struck up a conversation about how many hot dogs we all could eat. Then Andy had a light bulb moment and said, "Why don’t we make the hitting partners have an eating contest?" Everyone seemed to love the idea except for us three. Andy decided that the contest was going to happen so after the second practice he went and bought all of the necessary supplies. As we were going to Andy’s house, I was feeling decent about my chances. It was a tough day of practice so I was pretty hungry, and I like hot dogs. It seemed like a win-win situation. About 30 minutes into the barbeque Andy yelled over everyone, "Will the participants of the hot dog eating contest please report to the hot dog eating station!" Andy had set up tables in his back yard with about 40 dogs and buns. Literally everyone at the barbeque including Andy’s wife, Brooklyn Decker, came to the back to watch us eat. Five people were entered (most were forced into entry) and the competition was a race to see who could eat five dogs and buns in the least amount of time. I tried to intimidate my competitors beforehand by breaking out my sunglasses and headphones. It didn’t work. I got off to a slow start and that destroyed my hopes of a victory. The crowd favorite was definitely Tim Curry, who is a USTA employee. He got off to a hot start but fell off after a couple of dogs. The stage was then set for the reigning NCAA team and individual champion to shine. Steve Johnson destroyed five dogs and buns in 2 minutes and 39 seconds. That feat may be more impressive than his three consecutive NCAA team titles. If you don’t think so, please see how fast you can get down five hot dogs. As far as the tennis goes, the team has been working extremely hard in preparation for this weekend’s tie. Andy and Mardy are playing extremely well and when two top 10 players are playing well, it is pretty tough to be on the other side of the net. We rookies are definitely giving them all we have but they have a little bit more in the tank then we do. It’s really cool to see how they train on an everyday basis and handle themselves on and off the tennis court. It has also been awesome to spend time around the No. 1 doubles team in the world. Bob and Mike are great guys and I’m almost positive that they are impossible to beat. Those guys are unbelievable. They both serve huge, hit extremely big off the ground, and as my teammate Shaun Bernstein told me today, they haven’t missed a volley since 1987. Bradley and I got the call to train with them today and they just took it to us. We were playing pretty well but they are just everywhere. I’m feeling pretty confident about the team’s chance to win this weekend. Well I’m going to go to sleep, in my OWN room, with my KING sized bed and my temperature set to 68 degrees just like I like it. But I’m not so sure I’ll sleep as well as I did the first couple nights I was here. The hot dog eating contest definitely will not be the last embarrassing thing that we will have to do during this trip. During tonight’s dinner Andy and Mardy were thinking of a ton of embarrassing things to have us do. The worst one involved two cups of coffee, a bright yellow leotard, some sunglasses and about five dollars. Hopefully they will forget about the ideas in the morning…. Hey everyone, I want to start this blog off by saying that I’m extremely pumped up to be a hitting partner for this Davis Cup tie. Luckily half of Spain’s team is left-handed so I got the call. I’d say that the U.S. team is in good hands because the other two hitting partners happen to be the last two NCAA singles champions, Bradley Klahn and Steve Johnson. This is the first time that any of us have been in this position so it should be pretty fun to go through together. I know a couple of other players that have been hitting partners in the past and they have had some pretty good stories to tell. Hopefully my experience will be the same and I look forward to sharing them with you all. "The Rookies," as we are called, got in yesterday night and the main thing that was on all of our minds on the way to the hotel was which one of us was going to get our own room. Steve was trying to pull the seniority card and say that because he was the oldest that he should get it. That didn’t work and I ended up being the lucky one with my own room. Don’t mean to brag but, it’s nice in here. I have a king sized bed, nice television, and no one to argue about who gets the first shower or what channel to watch. I definitely went to bed yesterday with a smile on my face. Today was the first day of practice, and I woke up ready to go. The only problem about waking up ready to go was the fact that practice wasn’t until 2. There was a lot of anticipation coming into practice because we would be joined by a very important part of the Davis Cup team. Andy Roddick has the reputation of being extremely intense in practice, and rumor has it that if you miss too many balls, he chews you out. Last week I talked to Michael Shabaz, Denis Kudla, and former Davis Cup team member James Blake about what it is like being a hitting partner. The best advice I got came from Blake, he just told me, "Be ready to work." For the first hour of practice it was just Steve, Bradley and I drilling with Coach Jay Berger. During that time, Andy, U.S. Captain Jim Courier and Mardy Fish rolled in. We continued hitting until Andy was ready to play. This was Andy’s first time hitting on the court so he just wanted to get a feel for the surface. Bradley and I sat down and let Steve hit with Andy. I’m not sure if Steve knew what he was getting into. Their practice started off pretty simple. They were hitting up the middle for a while when Andy wanted to start playing baseline games. This was pretty entertaining to watch. Andy won the first seven points they played. Soon after, Jim told Andy about Steve’s ridiculous winning streak to end the college season. Andy’s reply was, "What? Really? Klahn, what were you doing all year?" After winning a couple more points he said, "Man I would dominate college tennis right now." Of course he was joking around, even if it was true. Another funny moment came later in the groundstroke points. Steve hit a drop shot and approached the net. As he was coming in, he realized that it was not as good as he had expected. Andy was left with a short forehand. Before Andy had the chance to hit his short forehand, Steve ducked under the net. Andy ended up missing the next shot in the net. He took a couple of steps back towards the baseline, turned around and said, "I know my reputation precedes me when he’s ducking on a short ball in the middle of the point." I don’t blame Steve because he was 100 percent going for him when he missed the ball. At this time Steve was hitting for an extremely long time and it seemed not to end. Andy would keep saying two more points, those two more points turned into about another 30 minutes without a water break. I’m sure it was tough to be on the other side of the net thought that. On the other side it was pretty cool to see a top 10 player’s practice habits. At the end of practice Bradley and I joined the two for some intense games of "squares". Squares is basically tennis played in the service boxes where anything goes. You can hit the ball anywhere (including on your own side), the only rule is that you have to stay in your own box. I had always considered myself a good squares player but I guess this is based off of me playing with my college teammates, not Andy Roddick. Andy really has the art of squares down. His court sense is ridiculous, I’m almost willing to say that it’s more impressive than his actual tennis game. I’ll be ready to take him out by the end of the week though. After a couple hours of him putting us rookies in our place, the practice was over. We had dinner at a steakhouse where we had our own private room. I’m guessing this is normal for celebs like Andy and Mardy, but for us that was pretty cool. We pigged out and went back. Tomorrow we are having a couple of practices and who knows what we will do off of the court. Hopefully another private meal or two will be in the future.